Intuition is life taking care of us (guiding us) but most people don’t trust life and therefore struggle like hell, turning to even more doing – while actually to stop the doing for a while is so much more productive and helpful. It’s when we take a break from the frenetic doing and trying to figure things out that we can relax and then let life come in and speak to us through intuition. But why is there hesitation, why do the majority of human beings second guess themselves so much? Why is it that when we feel something, we sense something is off, but we then a moment later ignore the feeling and instead make up a story about the situation and then decide that the story (imagination) is true instead? And then the agony begins; then there’s all kinds of emotions about what we just made up (the mind made story) and the feelings then spin on the story even more and suddenly the intuitive knowing that was instant has drowned completely in the minds chatter. Why is there not immediate trust? Because we have been trained and programmed to trust logic and reason more than our natural instincts. (Logic and reason must also be used of course, but in combination with intuition). We have been told since childhood to behave and to do as told so that programming is still what the mind runs on for many people. We have been trained into believing that it’s more important to be nice and polite so we don’t want to look weird and turn away from a situation that feels wrong somehow (or even dangerous) for the fear of what others might think if we just suddenly turned and walked (or ran) the other way. Animals don’t do this – if they sense danger, they simply move in a different direction and they leave the situation that feels threatening, weird or dangerous to them. We have those same instincts as well but we don’t use them as naturally and obviously; instead we let the mind in too quickly and we trust it instead of our gut feeling. Trust that first feeling you feel about something. The first hunch is usually right. Maybe there’s something in your life that you’re struggling with now, maybe you have a dilemma of some kind. Write them down and/or have your attention/awareness on them (without the drama/story, just feel into them), one by one, and feel what the option does when it comes to sensations in your body and feelings. Is there contraction and tightness (or a feeling of yuckiness or ‘no’), or is there a feeling of liberation, even joy? (A clear ‘yes’). The very first feeling is usually the right one and when we listen to it life puts us on the right path again, and the way you feel it’s the right choice for you is by the lightness it brings to you. Listen to yourself and trust what you hear and receive within. So often we stop and hesitate about our decisions and I think in general as humans we tend to overthink and second guess ourselves far too much and by doing that we get stuck in a fearful place and that in turn makes life feels stagnant. Intuition is unmistakable because it is direct, but it’s not loud. That’s the thing to become aware of – the small voice, not the loud one. The wisdom of intuition is not coming from thinking, so it can be very subtle but the more we trust it the clearer it gets and we begin moving through life more smoothly and one day decision and movement become one and the same. Sometimes it can also come like a flash of insight, or an aha, and you just know something and it’s very clear to you. And what always, always makes it easier to hear is when we let peace in. Not more doing and more thinking thinking things through, pondering solutions etc, but to let all that go for even a moment. Even to just sit and breath for 20 minutes does wonders! And when doing the exercise I mentioned; if the dilemma seem too big and you simply can’t feel your body’s response to the two different scenarios, then take a break from trying to figure out what you feel and so forth, stop worrying about it and decide to sleep on it, whatever it is, and let your intuition come up with a solution without your fear mucking it up. Just for today, stop thinking about it, stop doing anything about it and see how tomorrow unfolds. Drop the whole thing. Even the 20-minute-breathing-thing. Drop all of it and do something else altogether. When you feel your body begin to let go of tension, you know you’re headed in a wise direction and tomorrow might look vastly different when it comes to the whole thing. 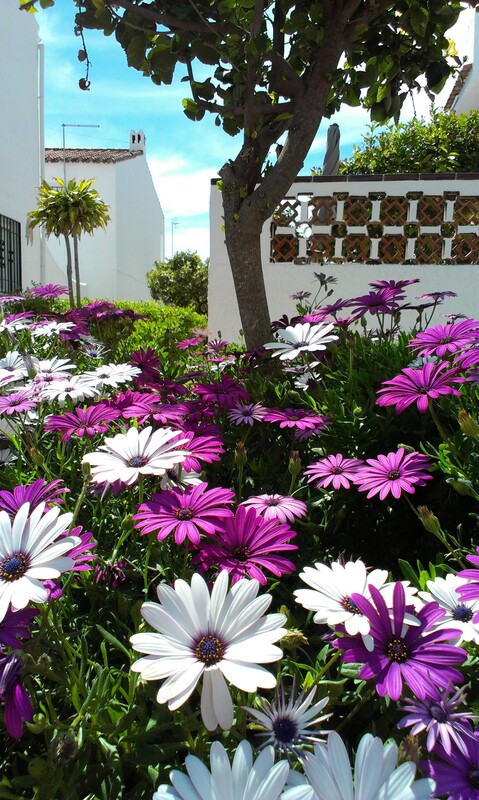 Beautiful flowers – pic taken from the area where I live. Become a member of mariaerving.com and get access to all my articles, and more!